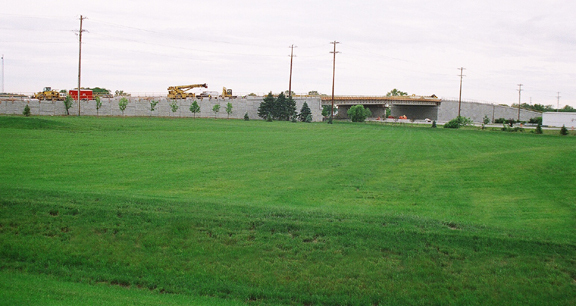 Project obstacles and solutions: Beaty Construction was awarded the construction project on the new Olio Road Bridge over I-69. They were looking for a local aggregate supplier to provide 130,000 tons of stone. Most of this was to be used as the backfill for the MSE wall. They needed a supplier who could give them quick service and a reliable product. IMI suggested that Beaty use #12 and #13 stone which they had stockpiled at the Stony Creek Aggregate Plant. This would provide the best value without compromising quality. The job specs had called for a different stone. In order to get a product variance with the county, the IMI Technical Services, Production and Sales staff worked together to help Beaty Construction secure the change. The stone was tested by independent sources and approved for use on the bridge. The variance was granted and Beaty was able to move forward with the bridge construction.